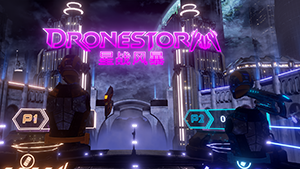 VRstudios, the provider of virtual reality solutions for location-based entertainment businesses, has released VRcade Drone Storm as its newest multiplayer, free-roaming VR game. Players aim to stay alive in a city overrun with attacking, mechanised drones in this high-energy, arcade shooter. The company’s chief marketing officer, Ron Davis, said: “This is the fifth fully immersive, totally wireless, full-motion game that we have released with several more coming in the next few months. The games are all optimised for our high-volume, out-of-home VR presentation and management platform for entertainment. The company has placed systems in 12 countries, with the latest custom attraction launched at Cedar Fair’s Knott’s Berry Farm Amusement Park on April 1, this year. The company released a custom title, VR Showdown in Ghost Town, which has been “extremely popular”.